Daisy Bunny is a beautiful cream bunny rabbit with soft fur, cute floppy ears and a short fluffy tail. 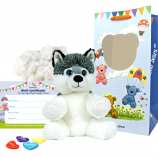 This kit contains Daisy Bunny 8" animal skin, super-soft stuffing, heart charm, birth certificate, party invitation and deluxe carry bag. 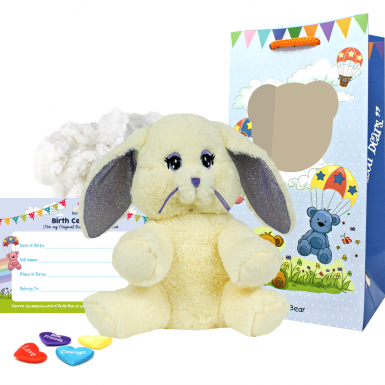 Our Daisy Bunny is a happy, hoppy bunny with cream coloured plush, purple whiskers and a purple nose. Daisy Bunny is a member of the eight inch range of build anywhere animals. Daisy Bunny is a European rabbit, originally from Spain and is thought to be the descendant of early domestic rabbits released into the wild. Although Daisy mostly feeds on grasses, leaves, tree bark and roots, she loves nothing better than the occasional lettuce! Daisy lives in a warren in the south of Spain with a large family of 8 other rabbits and enjoys running and playing with them during the summer months. During the winter, Daisy Bunny spends longer searching for food, but enjoys coming back to her warren for cuddles with her brothers and sisters. 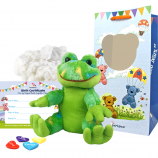 Daisy Bunny is suitable for children aged three and over and is a great gift for special occasions, birthday's and teddy bear making birthday parties. 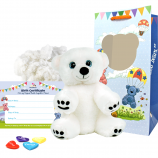 As with all of Be My Bear's teddy bear and stuffed animal making kits you will receive your Daisy Bunny skin with one-way zipper, a bag of soft and fluffy stuffing, our satin make-a-wish heart charm to bring Daisy Bunny to life, a birth certificate, party invitations and instructions. 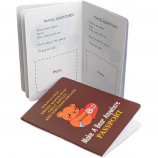 To complete the package we also include a luxury gift bag so Daisy Bunny can be carried around in style. Personalise by adding outfits, accessories and add-ons from the many ranges available or why not purchase blank t-shirts along with fabric pens to add that extra special touch!